On Aug. 12, 2011, I was drinking my morning coffee and reading Twitter when I noticed that Jacob Appelbaum had posted a link to a story about BART shutting down cell and wi-fi service in some of its stations the previous day. The reason for the shutdown? To thwart another protest against the July 3 killing of Charles Hill by a BART cop. Within hours, people on Twitter started talking about organizing a new protest. @OpBART – “Born of spilled innocent blood and banned airwaves” – came to life, along with the #MuBARTek and #opBART hashtags. Then, on Aug. 15, a Monday, the first OpBART street protest happened. A week later, another one. In all, the weekly (and once on a Thursday) events went on for nearly two months. Cops arrested dozens of people, including activists, journalists, and even some journalism students I’d brought to practice live tweeting at the #nofare protest on Sept. 8. Along the way, BART-related websites got hacked, and someone caused something of a flap when they circulated some pictures of Linton Johnson, the (now former) BART spokesperson who had originally dreamed up the idea for the cell and wi-fi shutdown. From the beginning of OpBART, @MotormouthNews on Twitter was, for me, an essential source of up-to-the-minute information about the protests. I don’t remember exactly when I started following the account (which has since been hacked, according to MotorMouth), and I didn’t even realize at first that it was associated with any of the organizers. And though I consider MotorMouth to be a reliable and entertaining source, I still know next to nothing about who they are – their real name, where they live, and so on. I thought you should know this before you keep reading. I did this Q&A with MotorMouth over email. I made light edits for structure, spelling, grammar and punctuation in some places. I also added links in MotorMouth’s responses. The avatar for @ExposeSec, MotorMouth’s latest persona on Twitter. At the time I published this interview, the account was down. UPDATE! What can you tell us about who you are and what you do? My name is MotorMouthNews aka MotorMouth aka MotorSec, I am an active activist, I plan protests, and I help mentor new online activists and give people support in securing themselves. I help run We Are Hidden which is a group of “OldFags” who wish to remain nameless who are dedicated to keeping new anon secure. I am also a full time activist within the Free Palestine movement. and i am a Grey Hat. I cannot say names without their permission, but I will say formerly the original CabinCr3w, started the operation. and lots of other anons helped as well, it was a worldwide effort within anon at the time. Can you remember the moment you found out about BART’s shutdown of cell and wi-fi service in their stations? What were you thinking at that moment, and what did you do next? We were in the cabin one day, researching and working on some things, then we came across the Oscar Grant shooting, and it upset us. We then tried to research the event and location we found out they had also shut down cell service to silence and dismantle protests, this upset us very much, so we decided to make it an op and we ran with it. 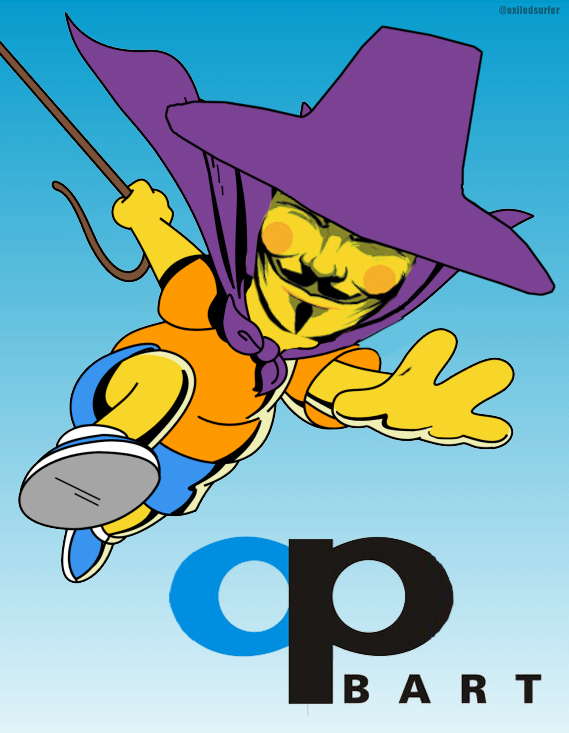 We very quickly came up with the name OpBART and reached out to the Anon community when we decided on what we would do. The Pop art stylings of @exiledsurfer. His pieces have been a highlight of OpBART for me. Describe, in as much detail as you can, how people planned the original OpBART protests. We started off finding as much videos as we can, looking at the shooting from many different angles, and seeing how much more crimes the BART PD has committed. 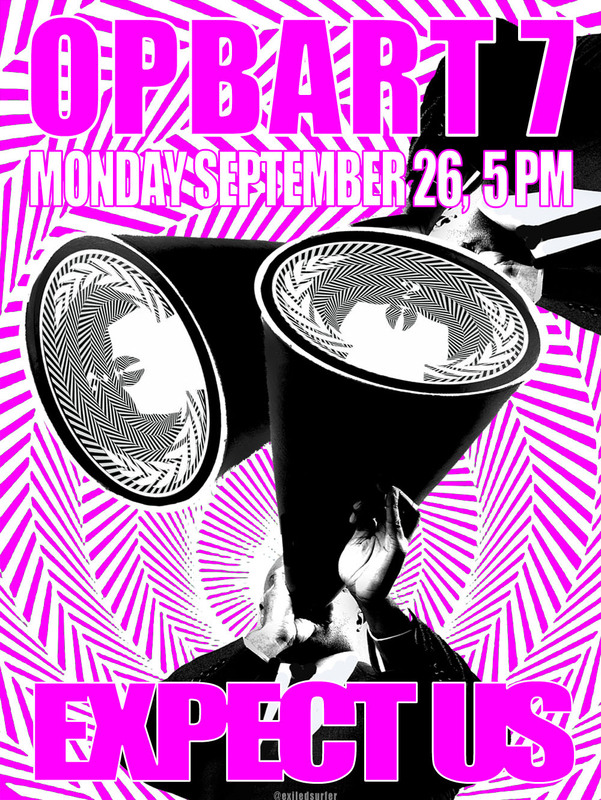 We then came up with a plan on how we wanted opBART to be and how we wanted it to run, which in turn ended up being nothing more than a protest, every Monday at the same time until the demands were met. We then pitched it to anons, and had exiledsurfer make some great posters for it, we also had anon2world and anonyops_ make some nice videos, and people took the operation very serious and jumped aboard. This is what made opBART a great op, everyone had part in it and people helped, that’s something you don’t see anymore. We also got enough info on the area and looked at maps, and got info on stations to direct people, and got people to livestream, which we have never seen done before but thought it would be best to document the protest. We also had everyone give their input or speak about any disagreements they would have if any, which also made it work because everyone worked in solidarity with each other. What was your favorite moment(s) from the original OpBART, and why? My fav moment from opBART was the very first one, seeing the energy it brought anons worldwide, knowing that we helped an already existing cause get attn was very pleasing to our minds, as this was a very serious cause. It is something i will never forget. What if anything surprised you about OpBART? It surprised me how it faded, The energy people had about the protests was something that was electrical, and it could have caused more changes if people had kept it up. But Occupy cut into it so it quickly faded. What do you think OpBART accomplished? Where did it fail? What would you do differently? OpBART brought attention worldwide to BART PD’s appalling behavior, it also raised the debate and concerns for censorship within protests, and it helped an already existing movement called “No Justice No BART” push their voice, we helped them, they helped us, and it worked out ok. I do think we got a little crazy with some of the ideas we had, but it was a work in progress and we did not want it to die down, which is where i think we did go wrong, also Occupy cut into it as i said before which also killed the operation, and BART PD started beating protesters which kind of put a little of fear into some of the younger people. I think what i would do differently would be to have started it more earlier throughout the year, and not got crazy with the plans/ideas. Which ideas? The hacking of mybart.org and bartpoa.com? The circulation of Linton Johnson’s pictures? We did not hack mybart.org, someone came into the chat room and said they hacked it for us and we threw them out of the chat room, it was not our intention and we never wanted any hacks associated with this op, this was strictly a physical protest op, as well as awareness. The ideas we later found ridiculous was when we tried incorporating some lulz into the protests and adding themes. The Linton Johnson pictures were justified, as 1. He played this little propaganda game with the BART customers and paid them to lie to the camera, 2. Did not do his job what so ever and said our main goal was to inconvenience the customers, which was NEVER our goal, and we did not, BART chose to shut down the stations because they needed a reason to get the public against us, and we never posed any threat to the customers, BART did…, 3. He needed to be shown he is like any one of us and not above us, which is why his pictures were circulated. Aside from concrete successes and failures, how important do you think OpBART was, and why? I think OpBART was very important, it showed how fast anon can transform from a cyber superpower to a physical superpower, and we showed how easily we can communicate from the net to the streets and do it highly coordinated. It also set the mood for Occupy in my honest opinion. Did OpBART change the way you think about activism, and if so, how? OpBART changed the way I saw Anonymous at the time, it also helped people not be afraid to get to the streets so i think it was very crucial. How did it change how you saw Anonymous? At the time, Anonymous still was unsure as to how powerful they we were, we took for granted the power of the Internet and the power of the people in general. We overcame those stereotypes of misguided teens who stood on the net 24/7 and we showed the world how powerful we can be. This op proved we can be anywhere at any time and do anything we set our minds to. The Op art stylings of @exiledsurfer. Only a couple of activists and a few journalists including me showed up to OpBART 7. By this time, Occupy SF was well underway. Why are you bringing back OpBART this year? What are the goals? Well OpBART gave Anonymous hope, and pride, it was also a milestone for a lot of anons even myself, so i think another run at it would be great and to show that we still have our hearts in the right places. Who’s involved in the planning of the new OpBART protest? So far it is just me, i haven’t felt the same solidarity i once have felt, and people are still so pre-occupied with Occupy. What can we expect to see Aug. 13 at the Fruitvale BART station? Hopefully a decent sized protest, and to spark that electricity in the minds of activists once again, and to see anons/Occupy/and pre-existing movements rise back up, the fight isn’t over yet, we have a lot more to go, we have new problems coming forth and we have newer enemies we must stand up to. When we stick together and show support for one another, only then can we achieve what we once have achieved, solidarity is more important than people think. What are the goals of the new opBART protest? Are we still talking about disarming and disbanding the BART police? Pushing for more changes to their policy on cell and wi-fi shutdowns? I think them having the power to shut off cell service now has only made them that more dangerous, and they haven’t calmed down whatsoever, they will only get more and more worse as time passes. They need to be disarmed, they need to be retrained, and they need the power of shutting off communications stripped away from them. The FCC should have been on top of this, so they are as much to blame. Hopefully this new protest can show new anons and old anons, that without all of the bs that has come from anon recently, we can do better, we can be back to our original selves, and we can show the world that injustices will not be overlooked. Are you working with the Occupy Oakland folks on this? I have reached out to Occupy Oakland people since i felt it was only right, since it is their town and they should have some say in this operation, also to get some sign of solidarity and have numbers rise once again. Hopefully we will see all of them out there since these crimes affect them as well. This entry was posted in Internet, San Francisco and tagged #opBART, anon, BART, CabinCr3w, cell phones, Charles Hill, Linton Johnson, MotorMouth, Occupy Oakland, OldFags, Twitter on August 12, 2012 by formerwinnower.